I was thrilled to be guest conductor for the final concert of the 2015-16 season of the Woodstock Chamber Orchestra, featuring Jay Ungar and Molly Mason. You may remember Jay and Molly’s performance in 2003 with the Columbia Festival Orchestra at the Shaker Museum in Old Chatham. If so, you know how much fun this was! At the Woodstock Chamber Orchestra’s May 22 concert (Quimby Theater, SUNY Ulster), a discrete note announced the abrupt end of Nathan Madsen’s period as Music Director. (“A change in Madsen’s circumstances has brought an end to his tenure with the orchestra.”) If you are curious you can just look his name up on Google and you will not enjoy the story you find. As a musician, Madsen rescued the WCO from the disastrous work of his predecessor and brought some ambitious projects to his work, and I’m grateful to him for that. 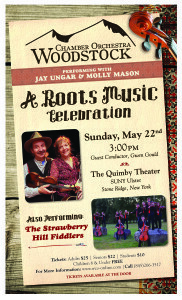 The May 22 concert was mostly a celebration of the work of Jay Ungar and Molly Mason, who performed some of their typical folk music delights, mostly with the orchestra. Guest conductor Gwen Gould, known for her work in Columbia County, added Copland’s little-known “Outdoor Overture” to the program. If it’s typical of her work, she should be a leading contender for the music directorship of the orchestra. The Copland was crisp and energetic, the orchestra sounding its very best. Gould also led the accompaniments for Jay and Molly very well. The brief cameo by the Strawberry Hill Fiddlers was also very entertaining, the music less elaborately arranged, and thus better, than some performances by the group I’ve heard. No profundities here but it was an enjoyable and well-attended, afternoon.